Comparison of Qlikview and Spotfire vs. PowerPivot little bit unfair and it is not anybody’s fault, it is rather a huge strategic mistake by Microsoft. Microsoft currently do not have a “BI product” (like they had it before in form of acquired ProClarity or short-lived PerformancePoint Server). Instead of product Microsoft decided (unless you agree with Microsoft that SQL Server, Excel, Visio and SharePoint are “BI Products“) to give people the reason to upgrade to Office 2010 and promoted a shiny dream (or idea) of self-service BI (see above, because BI is just a marketing term and Intelligence is not an attribute of any software in existence, despite propagandists from AI, BI and other “XI” areas), which is “BI-stack” based on multiple tools (like Excel 2010 and SSAS – SQL Server Analysis Services) and components (some of them are brilliant like PowerPivot and some of them just a virus like SharePoint). In order for users to get something based on Microsoft “BI-stack”, comparable with Qlikview-based or Spotfire-based applications they need an expert consultant(s). And again: most clients still want to compare these three tools above. PerformancePoint Server was introduced in November, 2007, and discontinued two years later. Current 3rd attempt focused on the burgeoning Data Visualization space, specifically at fast growing competitors such as Qliktech, Tibco Spotfire and Tableau Software. PowerPivot is an excellent in-memory columnar database, it outperforms similar functionality in Qlikview and Spotfire. While this 3rd attempt has some value, Microsoft failed to match their competitor’s most important differentiating factor for front-end design: ease of use and huge productivity gain. Specifically, the major problem is Excel 2010 has no visual drill-down capabilities. Users cannot use a mouse as a drill down tool. For example, it is not possible to outline a section of a pie chart or bar graph with a mouse, and have that outlined area be a drill-down selection. Excel 2010 requires the addition of complicated and confusing “slicers” to allow users to drill into the data. Perhaps the problem is that Microsoft is too big and not well-managed. Perhaps the Pivot team does not talk to the other BI development teams. Whenever a user makes any attempt to drill into an Excel graph/chart connected to a PowerPivot database, Microsoft requires the developer of that application to manually create a landing zone (in the form of an extra worksheet). This landing zone has to be carefully tuned and connected for each appropriate list box “slicer” that the developer creates for the application (the list boxes in Excel 2010 are difficult for users to maneuver as it is not readily apparent how to select and deselect choices). This process generates huge overhead, as data moves from PowerPivot to the landing zone and from the landing zone to Excel. And it happens each time slicers are used to change the selection of the data. The problem is exacerbated whenever the user wants to synchronize and view multiple charts and/or graphs (which, of course, happens all the time), since each landing zone and chart need to be refreshed from scratch and completely repainted. Each slicer is either disconnected from a chart or connected only to a designated chart. In order to enable synchronization between all the charts and slicers, each slicer needs to be manually reconnected with all involved charts. Imagine that you have 20 charts and 30 slicers and assume each slicer is already connected with one (1) landing zone. In order for your application to work properly, the developer has to manually hard-code 30*19=570 manual reconnections. 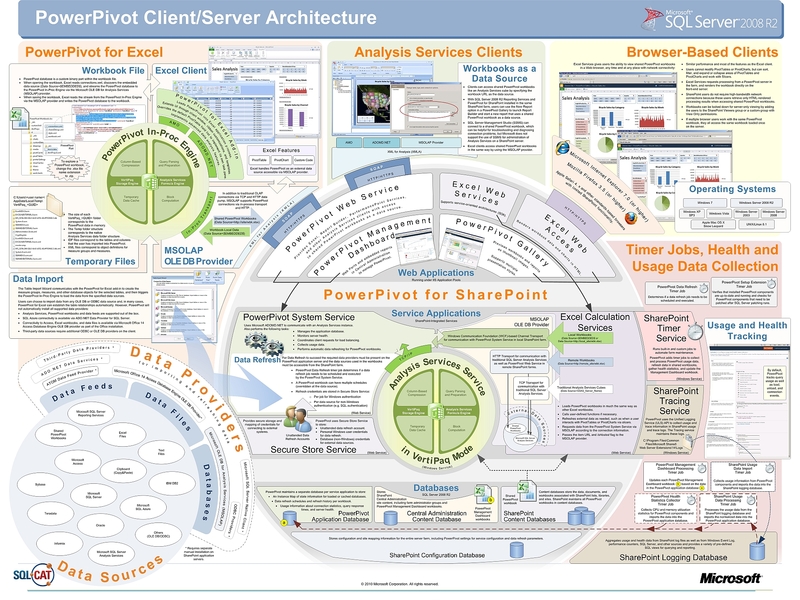 many types of Charts (I am aware of at least of 15 types) are excluded from any relationships with Pivots and Slicers, e.g. all Scatters, Bubbles and Stock Charts. In any case, it is clear that PowerPivot is a large part of the future of Microsoft’s BI stack. Agreed. My IT department has gone with the full Mircrosoft strategy, leaving the data analysts (Me) needing to create user complex interfaces. In the end, I spend more time training people on how to use powerpivot, excel, access, and sharepoint than presenting figures. The complexity makes most clients run in fear of hearing any technical terminology, and my hope after every action is that the software doesn’t have an intermitent crash and reboot to start over. We have an old version of Qlikview available (only compatible with Access 2003 files) and it is shuned from use. Funtastic! With 2013 Office, I guess most of the problems that you have stated has now been resolved. With Power View drill-down is made possible. More than anything now Power View is integrated completely into Excel making Excel one of the most sought after BI Tools. Over and above all of this, Organizations need not worry spending thousands of dollars on getting BI Tools, its anyways an integrated suite available in Office.